Mike Jull describes managing for landscape level old growth, as the SLU students consider the implications for carbon sequestration. Twenty-two graduate students and instructors from the Swedish University of Agricultural Sciences (SLU) visited ALRF on October 9th as part of a two-week intensive field course. Coordinated in partnership between SLU and the UBC Alex Fraser Research Forest, the group traveled through BC’s lower mainland and the Interior to speak with various forest practitioners and learn about our diverse management issues. In addition to touring the ALRF, the students’ two-day stay in Prince George included pine forests and caribou habitat near Bear Lake, as well as a visit to the Ancient Forest before continuing on to the McBride Community Forest. 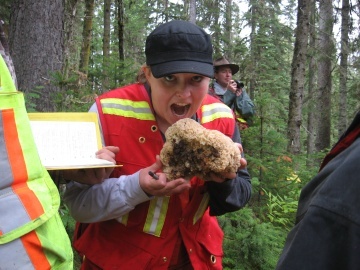 Tiffeny, a forestry major at UNBC, has fun with a fungus while learning about stand dynamics at ALRF. Doctors learn in teaching hospitals… natural resource managers learn in the woods. Last week, ALRF hosted nine UNBC students enrolled in the Field Applications in Resource Management course taught annually by Roy Rea, Senior Lab Instructor, UNBC Ecosystem Science and Management Program. This is by no means your basic field skills training. It is an advanced level, 3rd year course where students are pushed to apply their university training to address real-life, diverse, complex, and sometimes contentious natural resource management problems. Biologist Jesse LaFramboise of DWB Consulting Services, Prince George, uses Hansard Creek to explain the importance of assessing and protecting stream habitat for sustainable forest management and road development. 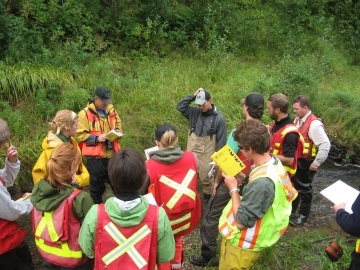 Students are taught through hands-on modules (from 2 to 4 per day) led by both faculty and natural resource practitioners ranging from forestry to guide-outfitting to mining. And it’s not all about hard science either, students are taught soft skills including concepts in multi-stakholder consensus-building and the social and spiritual importance of the environment to First Nations people. 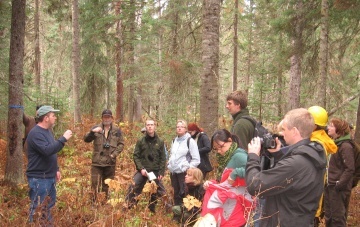 The UNBC students themselves represent several disciplines including Forestry, Environmental Science and Biology Majors, which promotes peer-learning.